Most bathrooms today would require contemporary bathroom light fixtures. 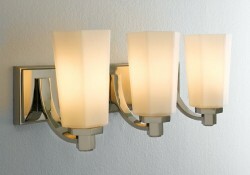 There are many types of bathroom light fixtures available, wall hangers, sconces, Victorian, or modern to name a few. With such a choice available to people it is then a surprise why people overlook choosing carefully their bathroom light fixtures. Lighting in any room is important because of how it can affect a person’s mood as well as provide convenience for any tasks. Taking control of your bathroom lighting can be simple. See if you have any natural lighting available, notice how large or small your bathroom space is, and consider how you want it to look. You are very lucky if your bathroom can draw in a lot of natural light during the day. If you have any curtains or drapes blocking natural light from entering these should be taken down. The windows can be frosted to allow the light to come in and provide privacy at the same time. Deciding to frost your windows will depend on the layout of the house and the bathroom. There can be a feeling of being too exposed, if the bathroom is closely facing another house for example. Once you have taken advantage of the natural light available during the day, the next stage is to plan the bathroom light fixtures. You’ll need to consider the décor in the rest of your home and pick the bathroom fixtures to match. The choice can be endless, from traditional, Victorian, to modern, chrome bathroom light fixtures. Each light fixture can enhance the overall style of the home. Most bathrooms today would require contemporary bathroom light fixtures. Larger bathrooms will need more lighting fixtures to fill the space up with light. The most important area in the bathroom to think about lighting for is around the mirror. This is used daily for grooming and needs to be properly lit. Improper lighting can create shadows making it inconvenient to groom. The ideal lighting arrangement around the mirror is to use 3 bathroom light fixtures, a sconce on each side and a light fixed to the wall right above the mirror. This will create even lighting on the face, making it easier to see everything. The bathroom is an important place in a home, as it the place where people start and end their day. So bathroom lighting needs to be flexible enough to provide relaxation in the bathroom as well as ample lighting for daily tasks. Online shops such as Amazon.com have a wide range of bathroom light fixtures to suite any bathroom size, style, and needs.